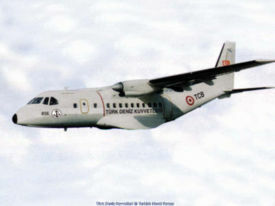 The CN-235 is a medium-range turbo-prop aircraft developed jointly between CASA in Spain and IPTN in Indonesia as a regional airliner and military transport. Amongst its military roles are maritime patrol, surveillance and troop transport. CN235-10: Initial production version (15 built by each company), with GE CT7-7A engines. CN235-100/110: Generally as series 10, but with GE CT7-9C engines in new composites nacelles; replaced Series 10 in 1988 from 31st production aircraft. Series 100 is Spanish-built, series 110 Indonesian-built, with improved electrical, warning and environmental systems. CN235-200/220: Improved version. Structural reinforcements to cater for higher operating weights, aerodynamic improvements to wing leading-edges and rudder, reduced field length requirements and much-increased range with maximum payload. Series 200 is Spanish-built, Series 220 Indonesian-built. CN235-300: CASA Modification of 200/220 series, with Honeywell avionics suite. Other features include improved pressurisation and provision for optional twin nosewheel installation. CN235-330 Phoenix: Modification of Series 200/220, offered by IPTN with new Honeywell avionics, ARL-2002 EW system and 16.800 kg/37.037 lb MTOW, to Royal Australian Air Force to meet Project Air 5190 tactical airlift requirement, but was forced by financial constraints to withdraw in 1998. It was purchased by the U.S. Coast Guard as the HC-144A for its Medium Range Surveillance Maritime Patrol Aircraft (MRSMPA) program. The first HC-144A was delivered by EADS CASA to Lockheed Martin for installation of the mission package in December 2006. 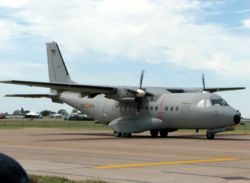 In August 2006 a total of 3 CASA CN-235-10 aircraft remain in airline service, in Africa, with Safair (2) and Tiko Air (1). ↑ "News Breaks", Aviation Week & Space Technology, 18 December 2006. This page was last edited on 6 March 2007, at 01:11.